“Fhtagn” means “Dreaming.” This is not what the macroer had in mind. The pun is most definately entertaining with that image. I also like the other image the phrase puts in my mind. Specifically that the word seems to mean both dead and dreaming. 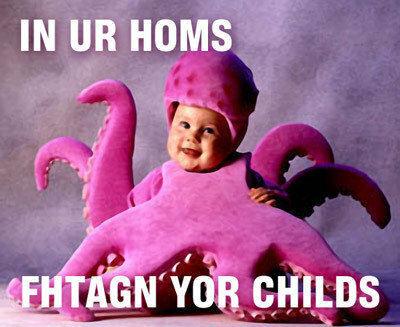 I will leave the flood of Cthulhu/dead baby jokes to those of you even more twisted than myself.